A HUGE THANK YOU TO BIGHURTCOLLECTOR!!! Thread: A HUGE THANK YOU TO BIGHURTCOLLECTOR!!! 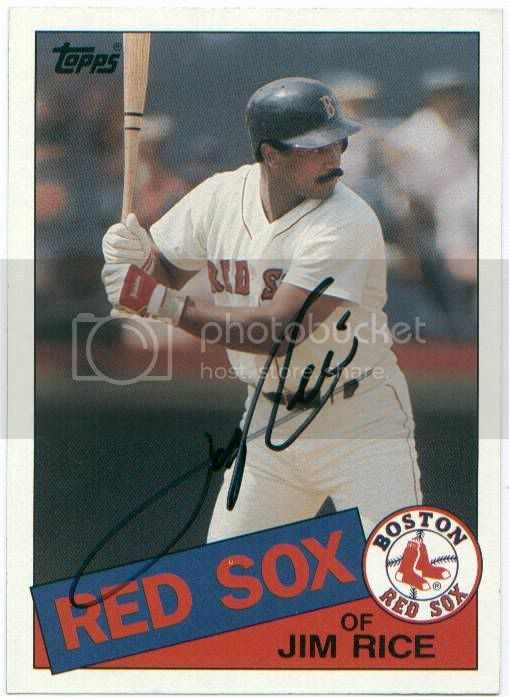 A week or so ago, Mark sent me a PM asking for my address as he had something for my Jim Rice collection. The note in part mentioned that he had it signed at a fund raiser this past November. This is awesome. I have many Rice auto's but this is my 1st IP signed card!!! Thanks again Mark for your generosity! This board continues to amaze! Re: A HUGE THANK YOU TO BIGHURTCOLLECTOR!!! That's awesome. What a great gesture. Congrats! Way to go Mark! Great card, great auto. That is a beautiful card with a nice sig too. Very cool. It's a 1985 Topps Super to boot! You're very welcome. Like i said i figured it was better in your collection, since I was trying to get him to sign my 87 fleers. Its funny I was actually there for Ozzie Smith mainly even though there were 50+ retired players I had something for everyone of them. I knew he was going to be there and didn't know his reputation with graph seekers but i'm glad i got something for someones collection that night glad you like it!